Every time I leave Tokyo I make the same declaration that it’s good to ‘get out of the city’. The reality of this however is that I’m not so much getting ‘out of the city’, more exchanging a bloody huge city for a slightly less massive one. Let’s be honest – it can hardly be said that trips to Osaka and Kyoto are quiet, secluded getaways! 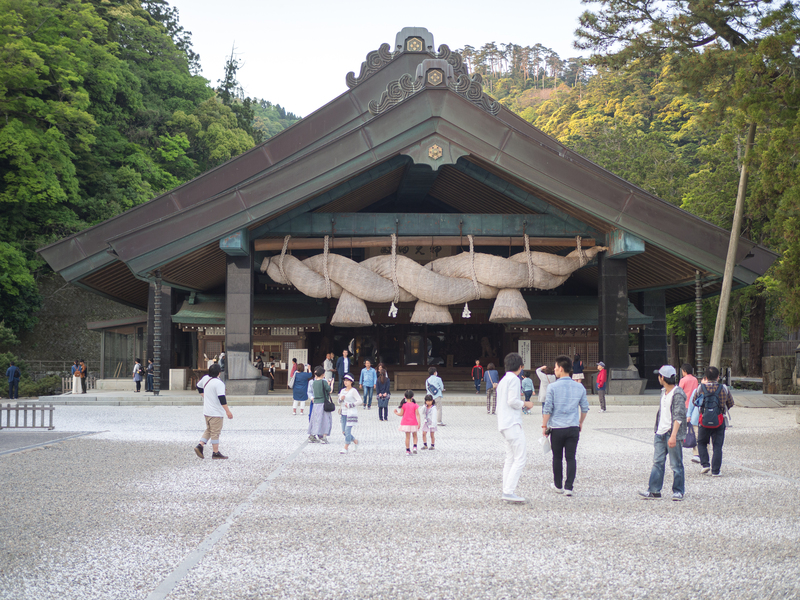 After a few days in Hiroshima though my next stop was to be a more quiet getaway than before as we were bound for Izumo – a small city in Shimane prefecture famous for its historical shrine: Izumo Taisha. The main (only?) reason people visit Izumo. As soon as I told anyone about my upcoming trip, I was greeted with the same question: why? It seemed like most Japanese people I spoke to were very confused as to why I wanted to visit Izumo and to be honest I had no idea myself. I suppose I liked the idea of getting off the beaten path for a while so to speak; oh yeah, that and the fact my favourite whisky drinking, chain-smoking 75 year old student recommended it to me. Michiko’s word is gospel. Oddly enough it was actually more convenient to take the bus from Hiroshima to Izumo rather than getting the train. In fact this trip was something of an eye-opener for me, as living in Tokyo I’ve got very accustomed to just turning up at the station and hopping on a train within five minutes. When you’re outside of the big city though the public transport is much less regular and it’s a bit like being back home, minus the obligatory dirty, late Northern Rail trains. Anyway, where was I? Ah yes, the bus. 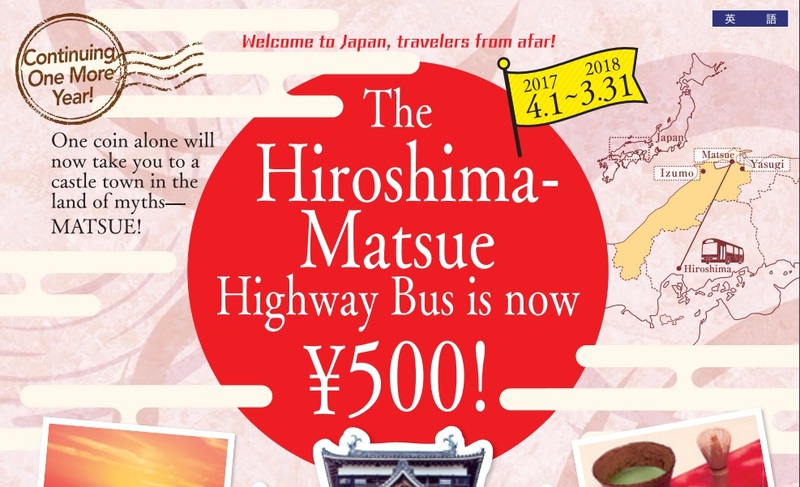 We stumbled upon the Hiroshima to Matsue highway bus which was offering tickets for an unbelievably cheap ¥500! All well and good until you read the small print which says it’s only available for foreign tourists – great news for Matt, not so great for me as I had to part with ¥3,900 for the exact same ticket. Find out more about this annoyingly good deal here. This leads me onto a bigger point about Japan and the benefits of being a tourist here. Now I understand wanting to make the country an appealing place for tourists, there’s absolutely nothing wrong with that, but the disparity in prices for a tourist and those of a resident is ridiculous! For this bus trip, my ticket had an 800% price hike purely because of a piece of paper in my passport. Just like the JR Rail Pass – a brilliant scheme allowing foreign tourists unlimited transport on all high speed and local trains for a set price – residents are being forced to pay extortionate prices for the benefits of travelling and wanting to get around the country they live in. I actually avoid taking the shinkansen (bullet train) at all costs because the prices are ridiculous – return flights often work out cheaper than a one-way trip! Anyway, rant over. After a three hour bus ride, and a subsequent 40 minute train from Matsue to Izumo we finally arrived at our hostel. We checked in at our Itoan hostel at 4pm and quickly headed out to Izumo Taisha with a new friend Miki. Just a quick word for Itoan: this was hands down the best hostel I’ve stayed in during my (almost) two years in Japan. 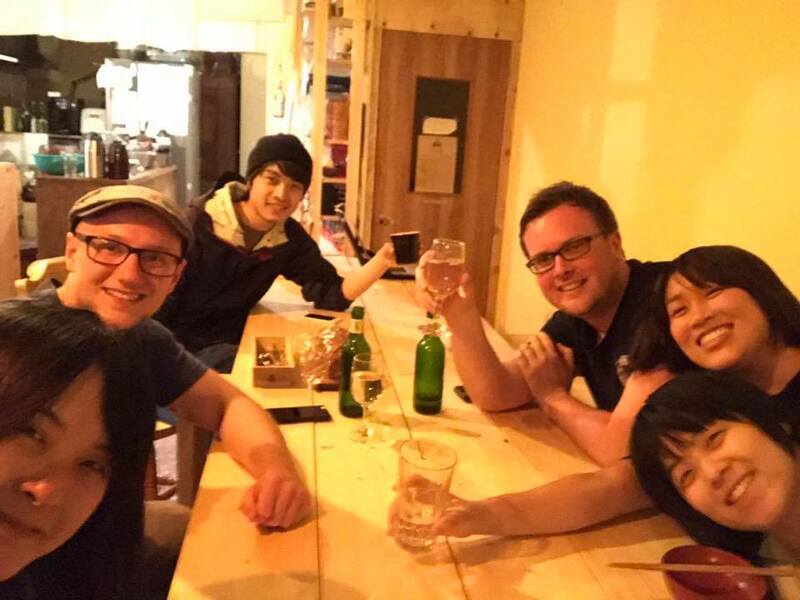 There’s a real homely feel to it and the staff and their friends – especially Emiko and Kazu – do everything they can to make you feel at home. The communal dinner and drinking session in the evening was a great laugh, and with it being Matt’s final night we ended up drinking the hostel out of beer. Oops. Smiles all round at the brilliant Itoan guesthouse! Anyway, back to Izumo Taisha. 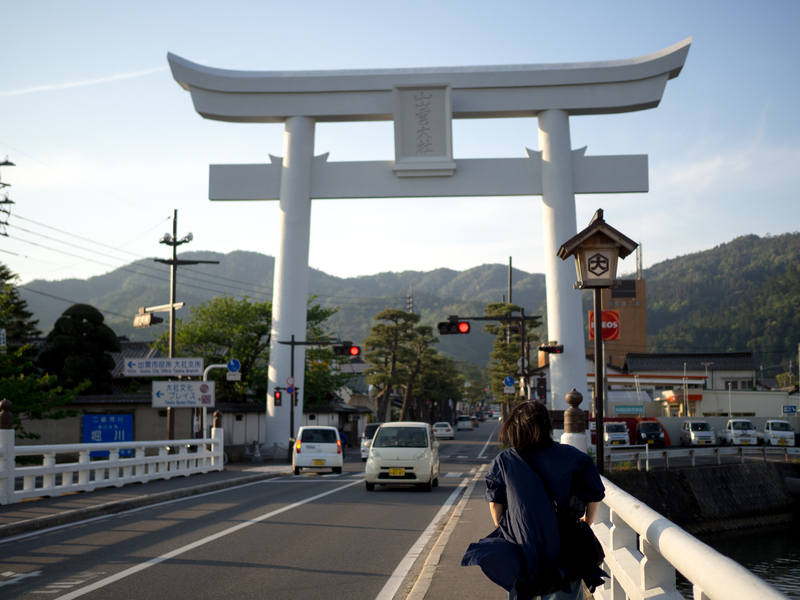 Despite staying in Izumo, the shrine itself was still a 20 minute train ride away so we found ourselves in something of a rush against time to get there before it got dark. The shrine itself is apparently the oldest shine in Japan and if you pray here you’ll have good luck in relationships or something. Maybe that’s where I’ve been going wrong. Anyway, you can’t really miss it thanks to the massive gates knocking about. Yep, I think we’re close. It was pretty busy even at 5/6pm, but I suppose that’s to be expected everywhere in Golden Week. At the risk of sounding like a broken record, I’m of the belief that once you’ve seen a few shrines you’ve probably seen the large majority but Izumo Taisha was quite impressive. The grounds leading into the main shrine were quite nice and as for the shrine itself, I’ve never seen so much rope in all my life. The shrine was even pretty busy as the sun was setting! 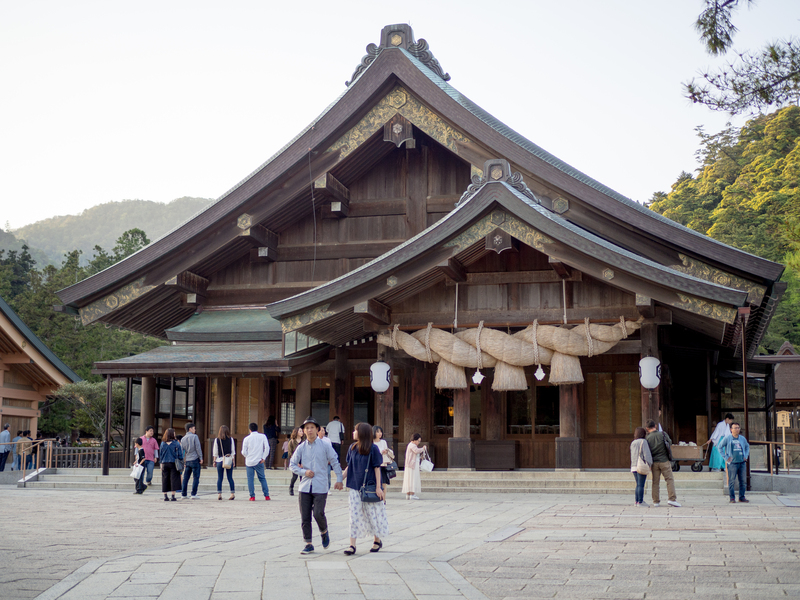 I also realised that instead of the standard two claps when praying, at Izumo Taisha people clap four times – twice for themselves and twice for their desired partners/loved ones. Don’t ever say this blog doesn’t teach you anything. I have a habit of occasionally overstaying in a place and in hindsight I probably did that here. Izumo was nice but outside of the Taisha there really wasn’t much else to see so on day two I ended up jumping back on the train to Matsue. Thankfully there was a bit to see in the city and I spent a few hours aimlessly wandering around taking photos as well as visiting the castle where I made a new mate. 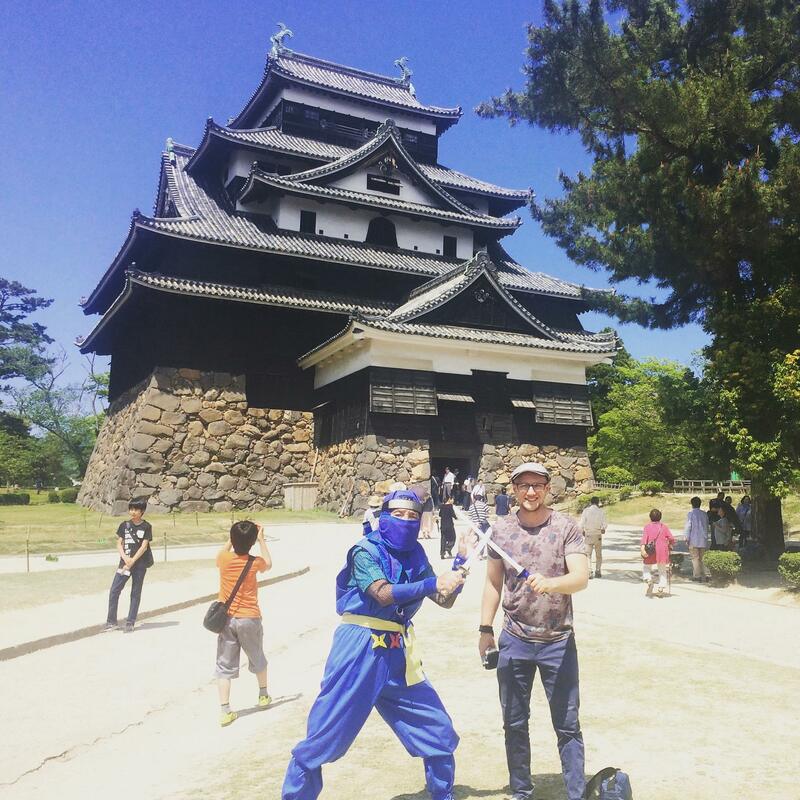 Another trip, another picture with a guy in a costume. As usual I made the effort to try the famous food which, just like most other places I’ve visited, seemed to be soba! Underwhelming as usual, if you were curious. After being able to wander no longer I decided to call it a day and head back to the hostel with the intention of an early night before moving on to Tottori the next day. Click here for Golden Week 2017, Part Three: Tottori!